So, what is a conservatory? Oddly enough, Wikipedia gives one description of a conservatory as a greenhouse with a tarpaulin roof. However, modern residential conservatories used as living spaces are far removed from this description. With at least three quarters of its roof made of any type of translucent (semi-transparent) building material or clear glass. Conservatories are really more about viewing the outside than anything else. However, a more recent trend is to fit solid roofs in place of a traditional full glass roof, but this does cut down on the amount of natural light within the room. In what other way is a conservatory different to an extension? The purpose of a conservatory is not really limited by anything other than size or design parameters, you can use it for work, rest or play. Whereas a “traditional” home extension is designed to expand the original living space within the contains of the property and not be a separate recreational area. It will be of a solid wall construction with a solid roof. Both are obviously ways to increase the size of your property, but a conservatory (due in part to its design of being primarily glazed or translucent) can be classified as a permitted development. This is very good because, as a permitted development, a conservatory can avoid the need to have planning permission in order to build one. You do have to build the conservatory to comply with the rules of permitted developments, more about which, you can find on the UK Planning Portal. To summarise, a conservatory is an extension to your home, which will feature lots of glass rather than brickwork, and also be more about enjoying the outside view from a room that feels like a special part the house. 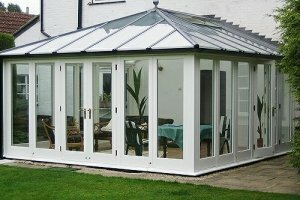 Budget conservatories are often roofed using polycarbonate panels. This material is very light so the roof structure can also be light. Subsequently, this makes using a poly-carbonate roof quite cost efficient. That low pricing aspect is, in our opinion, why it gained so much popularity in the first place. The most frequently talked about “down-sides” of using poly-carbonate for a roof are noise during rainy weather and heat build-up during sunny weather. Full glass roofing with double glazed panels are an excellent option. 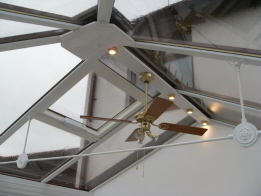 With products that offer solar control and self-cleaning, a glass roof for your conservatory can help manage internal temperatures as well as look great. 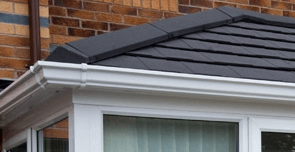 Tiled conservatory roofing can totally alter the appearance of the room, and with the advent of modern lightweight synthetic tiles, you have a wider choice of colour and appearance than ever before. Various accessories can be incorporated for purposes of style or function, such as tinted, patterned, leaded or coloured glass. Convenience accessories, to make life a little easier, can be items like remote controlled ceiling fans, electronic roof vents that have built-in functions such as rain sensors or thermostats. Adding sensors means that vents automatically open or close subject to weather and temperature conditions. High level spotlights are also a favourite. If you do not have solar control glazing in the roof, you could also look at applying a window film (similar to tinted windows in a car) that will help greatly in reducing UV and direct sunlight glare. 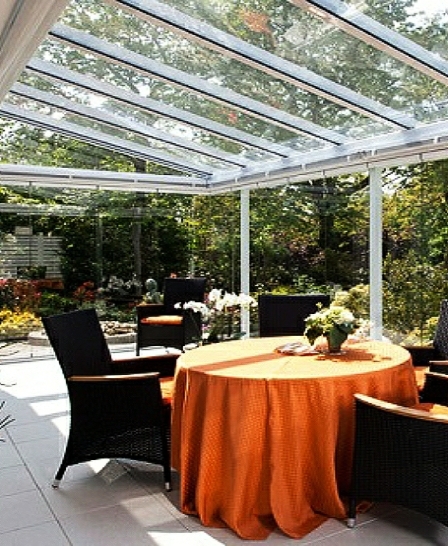 In terms of conservatory designs (appearance), there are so many to choose from. Such as the popular styles known as Lean-to or Victorian. 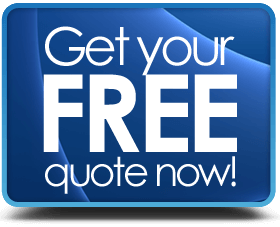 You also have the choice to have your conservatory constructed from timber, aluminium or uPVC. Clearly, you can paint a timber conservatory any colour you like, but you also have quite a wide range of choice when it comes to colour for both uPVC and aluminium. What are the benefits of having a conservatory? The additional space provided by a conservatory can be put to several different uses. It can function simply as additional space for the living / dining room, or you could create an amazing new kitchen extension. 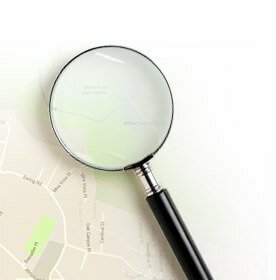 As a place to work or study, you will find it hard to get a better location. A conservatory enables you and your family to enjoy a panoramic view of the outside landscape without having to actually be outside in garden. Because of the additional room a conservatory creates, potential buyers will usually be willing to pay more to get a house with one. This is because it saves them the hassle of building one themselves. In addition to that, it adds elegance to the house’s general appeal and is thus preferred to a home without one. This room allows you to enjoy plenty of natural light from within the comfort of your own house. There are so many different types of conservatories in the market. Victorian conservatories are ornate and come with pitched roofs, bay fronts and ornate roof ridges. T-shaped conservatories are perfect for houses that are detached and have large gardens. 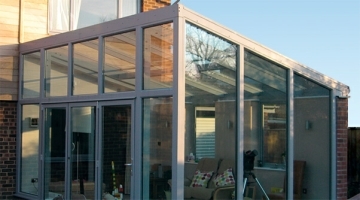 For those looking for low costs, the Lean-to conservatory provides a solution. Orangery conservatories combine equally the design of an extension and a conservatory exhibiting more brickwork than the conventional conservatories. Georgian conservatories exhibit rectangular flat front shapes. Gable conservatories are perfect for those looking for an upright height appeal. You can also mix designs. For example, combining a Georgian or Victorian design with a lean-to can give rise to a T or P-shaped conservatory that gives your home even more space. As touched upon earlier, building a conservatory does not always require planning permission if the size specifications are kept within regulations. A traditional bricks & mortar home extension will always need to have planning permission and have to meet the full list of applicable building control regulations. The difference in construction designs & execution also translates into lower prices for conservatories than for an equivalent sized extension. This is borne out by the average price for a decent sized conservatory of 3000 mm x 3000 mm ranges from £7,000 to £10,000 whereas a “full blown” bricks & mortar home extension can start from as much as £1,500 per M2 + fees of around 8% (£2,000 per M2 in London). That would make the starting price for a traditional extension around £15,000 to £18,000 at least (and this could be without adding VAT). 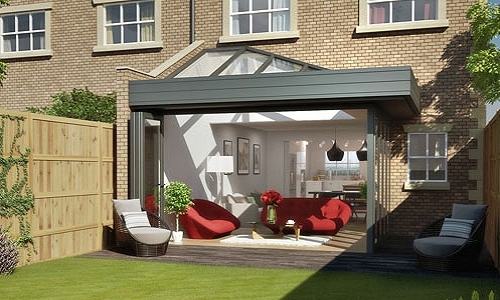 So you can get “more bang for your buck” with a conservatory when it comes down to living area. Conservatories are however limited in where you can build them, whereas you could build a loft, bedroom or basement extensions. If the overall effect you want to achieve is to bring the outside of the home inside, building a conservatory is the preferred way to go. Apart from the major savings in cost, they not only provide space but also bring great visual appeal and really are quite perfect for so many recreational, work or study purposes.